Tap into the local scene and skip the crowds at the resort hotels. Curley Bear Condo is located in The Meadows at Big Sky. You can walk to all of the locals' favorite spots: La Luna Mexican restaurant, Blue Moon Bakery, Hungry Moose deli and grocery to name a few. If you are into mountain biking, the Lone Mountain trail system loops through the Arnold Palmer golf course just outside your door. 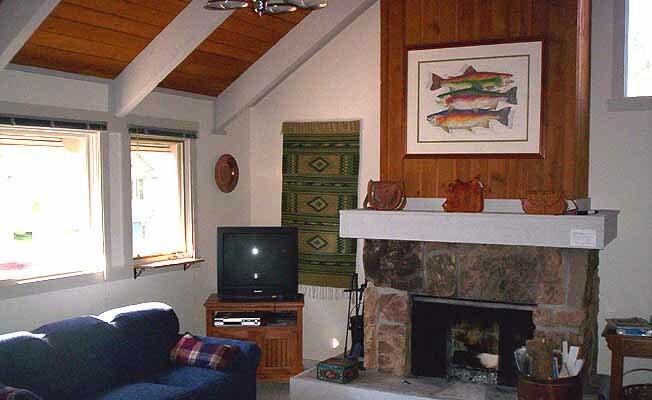 Right away you'll notice that Curley Bear Condo is well maintained and comfortably furnished. It's clean and cheerful with a sunny southern exposure and deck. We make a point of leaving the basics in the cupboard: coffee filters, sugar, spices, tea bags, cooking oil. Master Bedroom has a new king bed and private bath. Guest bedroom has two new twin beds and private bath. Queen sized sleeper sofa in the chalet style living room also has a half-bath. Free wood for the stone fireplace. Pool, sauna, and hot tub are just steps away. Washer/dryer in upstairs bath. Explore Yellowstone Park and see Yellowstone falls and Old Faithful. Take a trail ride in the Gallatin Valley or in the mountains. See the largest private buffalo herd in the US. Fish the Gallatin and in Yellowstone National Park. Play golf on the Arnold Palmer designed golf course. Go hiking and have lunch at the famous Lone Mountain Ranch. Have supper at The Corral; great food and cowboy atmosphere. Hike or ride your bike to Ousel Falls. Spend an afternoon at the spa at Moonlight Basin. Go whitewater rafting on the Gallatin.